She ventured west with the man she loved, but in one day her whole world had crumbled around her -. Nineteen-year-old Marty Claridge starts west with her adventurous, boyish husband, Clem, seeking to claim land and hoping for good fortune. But when the venture turns suddenly to tragedy, Marty is left alone with her great loss. And coupled with her grief and heartache is the grim reality that there is no way to return home. Clark Davis and his little girl, Missie, are also in great need. Clark’s wife has died, leaving him to care to Missie and the farm at the same time. His offer to Marty comes with good intention, but will courage and faith be enough to bring them to true love? A Compelling Love Story Set in the “Little House on the Prairie” Era. I absolutely loved this book!! I couldn’t wait to read the next in the series! 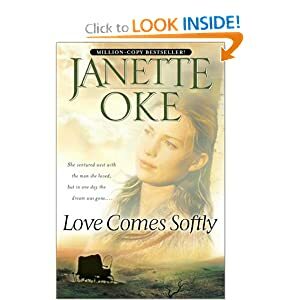 This is Janette Oke at her finest! If you loved the t.v. series, “Little House on the Prairie” you’ll absolutely love this series!! A definite must read!